In order to sustain our vibrant community, Beth David relies on the generosity of our members and friends, who are committed to supporting the continuity of our Jewish traditions and values through the generations. Thank you for choosing to support Beth David by donating to one of our many funds, dedicating a siddur or pew or by sponsoring a kiddush or publication. There are many options. When a donation is made, we can send a beautiful tribute card to the person in whose name you have made the donation or to their family. 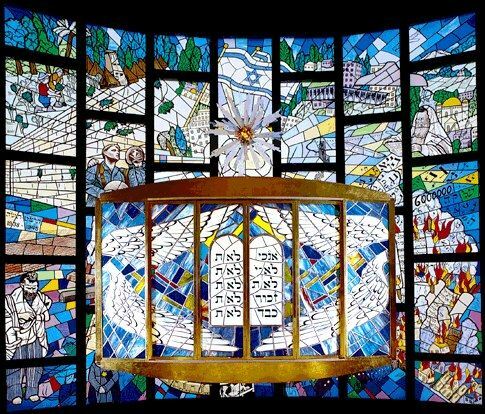 The acknowledgement cards feature the beautiful stained-glass window in our sanctuary, From Holocaust to Redemption. Your contribution will also be acknowledged in The Window, Beth David’s quarterly publication. For additional donation, dedication and sponsorship opportunities not included here or if you would like to pay by cheque, please contact the office at 416.633.5500. Minimum three days notice required for Enhanced Breakfasts One and Two. Surcharges apply for more than 10 guests. If yes, how many reserved tables? Minimum three days notice required. For Enhanced Congreagational Kiddush pricing, please contact the office at 416.633.5500. For Enhanced Seudah Shlishiyt pricing, please contact the office at 416.633.5500. Use this section to create your dedication and tribute card requests for any donation or sponsorship. A minimum $18 donation is required to send a tribute card. If you are dedicating multiple prayer books, please email Faye at faye@bethdavid.com or contact the office at 416.633.5500. By selecting 'Yes', a tribute card will be sent to the person(s) being dedicated, including the text of your dedication. Otherwise, no gift card will be sent. Your donation must be $18 or over in order to send a tribute card. Please review the details of your donation before proceeding to the Payment Summary.